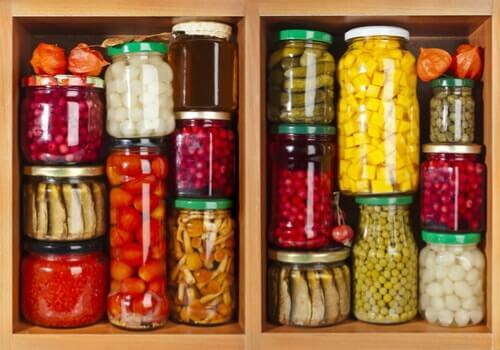 Properly storing food is one of the best ways to reduce the risk of poisoning and waste. Learning to store food correctly is an essential part of saving money and keeping yourself and your family safe. Stop throwing food and start storing it safely. 1- Do not store food under water pipes or taps such as onions, potatoes, etc. Water dripping from them will spoil the food, it needs to be stored in dry and well-ventilated places to extend their shelf life. 2- Wash berries in water and a small amount of vinegar before placing it in the fridge to help keep them fresh. Store it in the plastic container that came with it, or in a zip-lock bag. Place it in the back of the fridge where it stays cold. You can use the American Garden Natural Vinegar for this process. 3- You need to assure that inside the fridge is the right temperature! Ideally, your fridge should run right about 3-4 °C. This will store the food as fresh as it could be, without making the food so cold that it freezes. If you got your own tips and ways to store your food, leave us a comment and let us know about it!